They were gathered on the Easter/Passover holiday weekend to rally for a fair contract and back up their negotiating team in the final hours before their contract expired. The company, the largest unionized private sector employer in the nation, which posted a $20 billion profit last year, is attempting to cut health care and retiree benefits and outsource jobs. “If Moses were here today, he would say to Pharaoh AT&T, “Let my people have a contract!” declared CT AFL-CIO president John Olsen. AT&T workers from New York and other New England states came to show the solidarity of all CWA locals in the face of an attempt by this corporate giant to strip workers of benefits and outsource jobs. 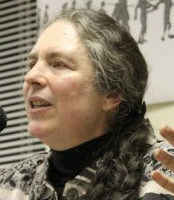 Solidarity was expressed by the presence of Occupy and community groups, speeches from other unions including the building trades, machinists, and Unite Here, and elected officials. All said they would stand by CWA workers whenever they are in need. Congresswoman Rosa DeLauro (D-3) proudly waved her CWA union card. She warned that Republicans would do away with unions and worker rights. U.S. Senator Richard Blumenthal also praised the workers for standing together and emphasized that the upcoming election is about the future of the labor movement and the direction of the nation. “You will make history here,” he said. 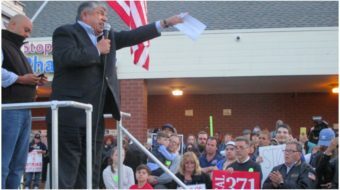 Sat Luciano, executive director of Council 4 AFSCME, called the struggle one for human rights. As the workers prepared to march the three blocks to AT&T headquarters, CWA Local 1298 president Bill Henderson thanked everyone who came out in support. With the rally filling Orange Street in front of the building, the negotiating team returned inside to continue talks. A vigil remained outside. 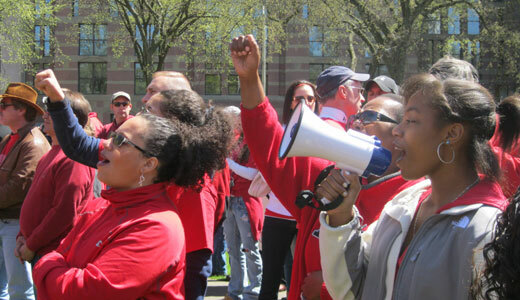 The AT&T contract with CWA Local 1298 covers nearly 4,000 Connecticut workers. Four separate contracts in the east, midwest, and west covering 40,000 workers expired over the weekend. The contracts have been extended. The strike vote taken by the union members allows the workers to strike if no settlement is reached. 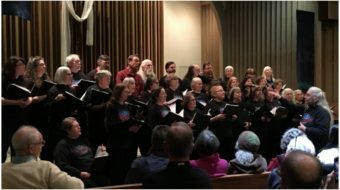 The union urged its members to participate in the 99 percent’s Spring trainings next weekend to mobilize a giant force across the country to take on corporate greed.